It's Saturday. Garage sale day. Hooray! I love garage sale-ing more than I love a lot of other things in life. Garage sale-ing comes in a close fifth to dancing, chocolate, sunshine and laying in bed past 7am. My husband has not always loved me for this undying passion of mine. I have been known to walk out the door at 6am on a Saturday morning with a small cup of coffee in hand only to return at 12 noon with a full carload of items we need and can't live another day without. Over the years I have slowly learned that this method of treasure hunting has not treated our small home well. At the point we find ourselves swimming in things we might use someday, my husband has had to put his foot down. I'll admit that I have struggled showing restraint. Somehow those items which I believe have a true purpose in our home will still find themselves in my car around the 11 o'clock hour. Recently, with the advent of smart phone technology so readily at my fingertips, I've begun a new method of distinguishing between my needs and my wants. Admittedly, there are times when it gets quite confusing in my head trying to tell the difference. 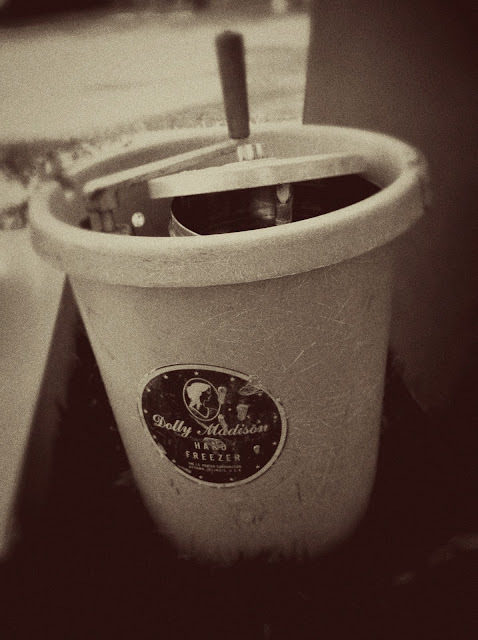 Take for instance the above pictured vintage Dolly Madison Hand Crank Ice Cream Freezer. I found it at a church yard sale. Clearly someone dug this thing out of the basement. It was cool. It was retro. It needed to by mine. "You've been wanting to make homemade ice cream for months now. This is your chance." "But you have nowhere in your kitchen to store this gigantic contraption." "True, but I can certainly find something to clear away to make room." "You know that you won't make hand crank ice cream more than once a year... if you're lucky." "No way, not true. I'll certainly make it every week if I have such a handy contraption such as this Dolly Madison Hand Crank Ice Cream Freezer in my kitchen." And on and on I go until I finally decided to text my hubby a picture of the darned thing. "Babe, I need this. I've been wanting one forever. What do you think?" Three minutes later, the answer is clear. No. Hell no. We can't go back to swimming in things we might use someday. Agreed. He's right. No. Hell no. Walk away Judith. Walk away. I'm glad I did. The Dolly Madison Hand Crank Ice Cream Freezer incident was a few weeks ago—and looky-here— low and behold I'm still alive without it. Have I thought about making homemade ice cream between then and now? Yes, yes I have. But it was fleeting. Would I have taken the time to hand crank my ice cream between then and now? Heck no. It was a good decision to leave it for another ambitious soul on that church lawn. 1) Is there a spot in my home so barren it is virtually begging to be filled with this item? 2) Is there some place I've been meaning to clear out for ages and this item will give me the motivation to do so? 3) Have I been eyeing this item at full price in the retail store and have been waiting for an opportunity like this to procure it for pennies on the dollar? So get out there this week fellow garage sale lovers... find your treasures and show some restraint. Your housemates will thank you for it.